Haldighati is an important historical site in the context of Rajasthan, India. Actually, Haldighati is a mountain pass in the Aravalli range connecting districts of Rajsamand and Pali in Rajasthan. The place is at a comfortable distance of 40 kms from the city of Udaipur. The term Haldighati has been derived from the yellow colored soil of the place that gives a sense of turmeric (in Hindi, turmeric is called as 'Haldi' and valley is known as' Ghati'). Haldighati is famously known for the historical battle of Haldighati, which took place in 1576 AD between Maharana Pratap Singh and Man Singh, the general of Mughal emperor Akbar. This battle is considered as one of the most significant events in the history of the Rajputs, and this battle was also one of the shortest battles in Indian history, which lasted for only 4 hours. Today, the Haldighati pass, in which the battle took place, stands as a tourist spot, with great memories of Maharana Pratap Singh and his brave horse Chetak. The term Haldighati has been derived from the yellow colored soil of the place that gives a sense of turmeric. This place was the battlefield for the legend Maharana Pratap and also the place where his mount, Chetak, breathed his last. 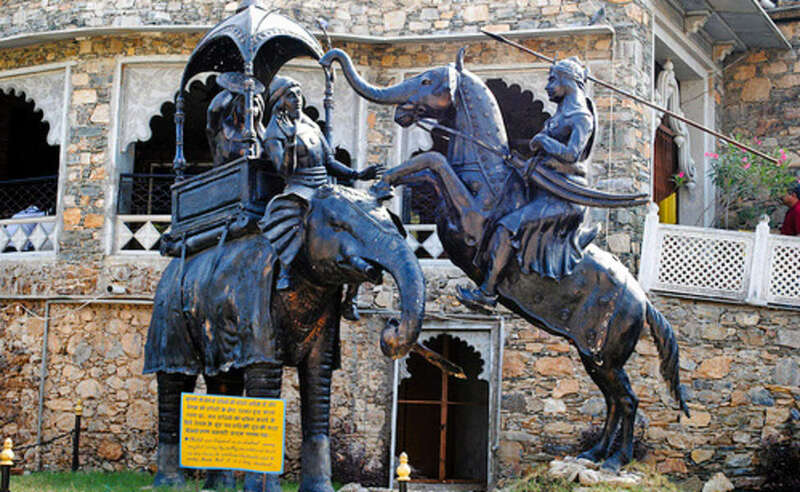 Maharana Pratap erected a small monument for his horse at the place where Chetak fell. The cenotaph still exists at Haldighati. The Government of India commissioned the construction of Maharana Pratap National Memorial in the year 1997. The memorial features a bronze statue of the Maharana astride Chetak. There is a museum named Maharana Pratap Museum which displays many weapons and paintings of the famous battle. This imaginative museum was started in the year 2003. Light and sound shows give a glimpse of the events inside the museum. Balicha Village, located at a short distance from the place, is famous for its terracotta crafts. The presence of 'Chaitri-Gulab' makes Badshahi Bagh famous. Original rose water and 'Gulkand' (jam made from rose petals) that has immense medicinal value are prominent highlights of this garden. Close to this place, you can visit Balicha village that is famous for its terracotta crafts. Badshahi Bagh is another place which is renowned for 'Chaitri-Gulab'. Here you can find original rose water and 'Gulkand' (Jam made from Rose petals) that has immense medicinal value and really tastes good. Thus, Haldighati is a place of interest for the people who value history and respect the heroes of India for their priceless efforts. The fort is open from 9:00AM to 6:00PM every day. The entry fee Rs. 50 to 100 per persone.